Crew Mom: Happy Birthday, Garrett! 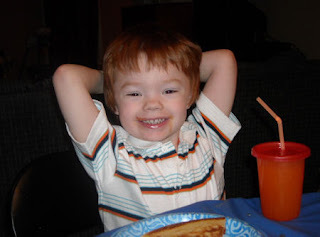 Garrett turned four years old on October 14, 2009. We had his family birthday party on Sunday evening. The little guy requested balloons, party hats, cake and pizza. 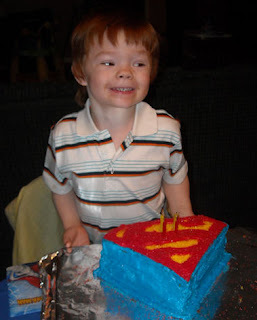 He can't make up his mind which super hero he likes best, so he had batman plates, spiderman napkins and a superman cake. Garrett is such a smart and funny guy! He always has something witty to say and it will usually make you laugh. These days, he has gone to calling himself: Super-Fast Garrett, Spiderman Garrett, Batman Garrett or Superman Garrett. Can you see a running theme here? In keeping with the theme, Garrett received all hero related gifts this year. Among the favorites are his Spiderman costume courtesy of Aunt Jessica, Uncle Jeremy and cousin Morgan, his super hero set from Meemo and Papa and his batcave from his brother and sisters. That pizza really hit the spot...............now I am just going to sit back, relax and wait for some cake. I'm tired of smiling, just cut the cake already! Is this good enough? 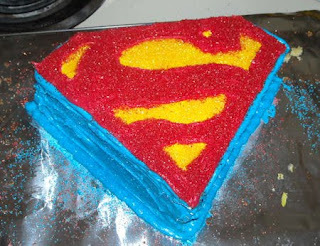 Superman cake that I spent hours creating. Destroyed in less than 5 minutes.